Genelia Deshmukh (née D'Souza; born 5 August 1987) is an Indian film actress and model. She has appeared in Telugu, Hindi and Tamil films. After gaining wide attention in a Parker Pen commercial with Amitabh Bachchan, Genelia began her acting career with the box-office hit Tujhe Meri Kasam in 2003. She was recognized for her role in Boys the same year, and later established herself in Telugu cinema by acting in several Telugu films during 2003–2012. Genelia received her first Filmfare Award in 2006 for her performance in the Telugu romantic film, Bommarillu, which earned her critical acclaim. In 2008, she gave critically acclaimed performances in Santosh Subramaniam, a Tamil remake of Bommarillu, and the Bollywood movie Jaane Tu... Ya Jaane Na. Having acted in several commercially successful movies in Telugu and Tamil, Genelia has established herself as one of the leading actresses of the South Indian film industry. In addition to mainstream acting, Genelia has hosted the television show Big Switch, and is the brand ambassador of Fanta, Virgin Mobile India, Fastrack, LG Mobiles, Garnier Light, Margo, and Perk in India. Genelia with her family at the CNBC Awaaz consumer awards in 2010. Seen here from left to right is her father Neil D'Souza, her mother Jeanette D'Souza, herself, and at the extreme right, her brother Nigel D'Souza. Born in Mumbai Genelia is an East Indian, a Marathi speaking Christian from North Konkan. She was raised in the Bandra suburb of Mumbai. Her mother Jeanette D'Souza was a managing director of the Pharma Multinational corporation. She left her job in 2004 to help Genelia with her career. Her father Neil D'Souza, is a senior official with Tata Consultancy Services (TCS). She also has a younger brother, Nigel D'Souza, who works with the Bombay Stock Exchange. According to Genelia, her name means "rare" or "unique", and is a portmanteau of Jeanette and Neil, her mother and father's names. She is also often informally referred to as Geenu, her nickname. Genelia studied at the Apostolic Carmel High School in Bandra and later joined St. Andrew's College in Bandra to pursue her bachelor's degree of Management Studies. She completed her degree while shooting for her first film, Tujhe Meri Kasam in 2003 and initially thought that an MNC job would suit her. She liked sports and studies in college, and was a state level athlete, sprinter, and a national level football player. Genelia did her first modeling assignment at the age of 15, the result of being spotted as the bridesmaid at a wedding. She was selected for the Parker Pen commercial with Amitabh Bachchan, just two days before her exams, and had to shoot the next day. Initially she refused, because of her exam the next day, but the director persuaded Genelia to shoot for the commercial. She gained wide attention from the Parker Pen commercial with Amitabh Bachchan, who said "she was good, and her expressions were spontaneous". She further did a Fair & Lovely 2003 Cricket World Cup advertisement with cricketer Krishnamachari Srikkanth. When Genelia was offered a role in Tujhe Meri Kasam, initially she turned it down, as she was not keen to pursue a career in acting. But the crew insisted and kept contacting her for two months, and she agreed when she saw the Telugu version of the movie. Tamil director, S. Shankar, was impressed with her performance in the Parker Pen commercial and decided to cast her in a leading role in his 2003 Tamil film Boys. Genelia was selected among 300 girls, who had auditioned for the movie. She signed three movies simultaneously in three different languages, Tujhe Meri Kasam (Hindi), Boys (Tamil), and Satyam (Telugu). Genelia's professional movie career began, with her Bollywood debut Tujhe Meri Kasam in 2003. Film critic Taran Adarsh noted, "Genelia is a wonderful performer. She catches you unaware with a performance that's natural to the core." The film was a box-office success. However, it could not do much to propel her career in Bollywood. Later, she decided to act in South Indian films. The same year, she made her Tamil debut as the teenage girl Harini in Boys, a story about five teenagers having stereotypical teen-boy fantasies. The movie, though noted for its vulgar sexual content, was a box-office success, and subsequently she started receiving Telugu film offers. She left Tamil cinema for a while to concentrate on the Telugu film industry. She made her Telugu debut in 2003 as a medical student in Satyam. Sify noted in their review that, "Genelia is excellent as her body language is her major asset." The movie was well received, and it raised her profile in the Telugu film industry. In 2004, Genelia appeared in her second Bollywood movie, Masti. The comedy focuses on three close friends who reunite after three years, but are now married and are being harassed by their wives. Genelia portrayed the character of one of the wives. Taran Adarsh was complimentary of Genelia's role, saying, "Amongst the wives, Genelia is the best, [...] Genelia looks the stern and demanding wife and is sure to be noticed." The film was a box-office success. The same year, she appeared in two Telugu movies Samba, and Sye, both succeeding at the box-office. After appearing in her first Telugu movie in 2005, Naa Alludu, she starred in the Tamil romantic entertainer Sachein. A review in The Hindu noted, "Genelia, who hardly made an impression in Boys, makes much impact in Sachein." The movie evoked mixed response from audiences, but was well received with the younger generation. She later appeared in the Telugu patriotic movie Subhash Chandra Bose. The year 2006 marked a significant turning point in Genelia's career. She completed two Telugu movies in early 2006, one was the romantic comedy Happy, and the other was Raam. She then portrayed the role of Haasini, a vibrant, effervescent and a happy-go-lucky young girl, in the 2006 Telugu romantic film Bommarillu. The movie, a blockbuster at the box-office, grossed ₹250 million (US$3.5 million) in India, and also won the 2006 Golden Nandi award. Her character was well received, and garnered her the Telugu Filmfare Award for Best Actress, besides Nandi Special Jury Award and Santosham Award for Best Actress. Sify concluded about her acting in their review that, "The scene stealer is Genelia with her innocent looks and cute mannerisms. She does not overact and we just fall in love with her character. Genelia looks like a dream in chic skirts and is the life of the party and raises the bar of the film." Following the success of Bommarillu, Genelia played the role of the daughter of a local don, in the Tamil gangster film Chennai Kadhal alongside Boys co-star Bharath. Rediff.com criticized her commenting, "Genelia stands up yet again to prove the point that if you are pretty and well dressed, you can get away with anything, without acting." Shortly afterwards in 2007, Genelia played the role of sister of a notorious gangster in the blockbuster Telugu movie Dhee, set against a gang war backdrop. The following year, Genelia appeared in the 2008 Telugu romantic thriller Mr. Medhavi, in which she portrayed the role of a student from Canada. The movie was successful, with Rediff.com complimenting her performance saying, "Genelia is her effervescent self – full of joie-de-vivre and lights up the screen." She made her Kannada debut in Satya in Love the same year. Later, she was cast in a leading role in Santhosh Subramaniam, a Tamil remake of Bommarillu. The film also turned out to be rather successful as its predecessor. Sify described Genelia's portrayal as "the soul of the film" and the film's "biggest strength", however Rediff.com described her character as "appears a little too good to be true." In June 2008, following a nearly five-year hiatus in Bollywood, she appeared in Mere Baap Pehle Aap, which failed to make profit at the box-office. A Rediff review noted, "besides her apparent cuteness, brings in tons of freshness and traits to the youthful characters she chooses to play", while a Sify review criticized her stating, "Genelia is sprightly but has a standard two-three expressions bank in this film." She later appeared in the Telugu love story Ready alongside Ram, which was well received. Her breakthrough performance in 2008 was through the portrayal of the role of Aditi Mahant in the blockbuster Jaane Tu... Ya Jaane Na, which was an economic success across India and overseas, grossing ₹564 million (US$7.8 million). Her role was widely admired for her sweetness and freshness, and new style of acting, with Rediff describing her acting as a "spark that has been missing in Hindi cinema for well over a decade now". In that same year, Genelia acted in the Telugu romantic comedy Sasirekha Parinayam. The movie received favorable reviews, and Sify noted in their review that, "The life of the film is definitely Genelia and she has shown the varied emotions from innocence, sadness, romance and anger in equal proportions without a hitch." In 2009, Genelia was cast in the Hindi film Life Partner, in which she was criticized for her performance. Indian film critic Rajeev Masand commented, "The adorable little imp from Jaane Tu… Ya Jaane Na has turned into a nagging harridan in this film, and how you wish she'd immediately enroll for acting lessons." Her next appearance in 2009 was in the Telugu thriller Katha, which was well received, and for which she won the 2009 Nandi Special Jury Award. In 2010, Genelia appeared in Chance Pe Dance and Orange, both receiving poor reviews from critics, but her Uthama Puthiran was a moderate success in Tamil. D'Souza had a major role in 2011, starring as the Muslim warrior princess Arackal Ayesha, in her debut Malayalam film Urumi. The film is about a fictional story happening in Calicut, Kerala during the 15th century, about a boy who plots to assassinate the Portuguese explorer Vasco Da Gama. She learned horse riding, and spent two weeks of training to use the sword, the short stick, and movements of the Dravidian martial art Kalarippayattu. The movie portrayed her image makeover from typically girl-next-door roles to more serious roles. Her next appearance was in the Bollywood action thriller Force, which received mixed reception from critics, with Taran Adarsh of Bollywood Hungama noting that D'Souza is strikingly sweet and subdued. She played the role of a journalist alongside leading actor Vijay in Velayudham, which was also commercially successful. She appeared in Tere Naal Love Ho Gaya and Naa Ishtam in 2012 and in cameo appearances in Jai Ho and Lai Bhaari in 2014. Genelia D'Souza walking the ramp for Neeta Lulla at the Lakme Fashion Week 2015. D'Souza was a part of Tamil director Mani Ratnam's stage show, Netru, Indru, Naalai, an event which seeks to raise funds for The Banyan, a voluntary organisation which rehabilitates homeless women with mental illness in Chennai. She was one of the judges at the grand finale of Gladrags Mega Model and Manhunt 2009 contest on 28 March 2009. She also walked the ramp alongside Tushar Kapoor for fashion designer Manish Malhotra at the Lakme Fashion Week 2009 on 28 March 2009. On 5 April 2009, D'Souza was among several Bollywood celebrities to perform at the Pantaloons Femina Miss India 2009 finale in Mumbai. In October 2009, she appeared as a showstopper for jewellery designer Farah Khan Ali on the second season of Housing Development and Infrastructure Limited (HDIL) India Couture Week, a platform created to celebrate India's fashion heritage by showcasing the country's leading couture designers. On 24 October 2009, D'Souza began hosting Big Switch, a television show based on slum kids on UTV Bindass channel to reach a bigger audience. She has unveiled Spinz Black Magic deodorant on 7 October 2009 in Mumbai, and the Ceres Store retail outlet. At the Chennai International Fashion Week (CIFW) in December 2009, she appeared as a showstopper for designer Ishita Singh's spring-summer indigenous collection of 2010, showcasing the best of Indian and Western dresses. She also holds a Limca world record of delivering four different super hit films in four different languages, Ready (Telugu), Satya in Love (Kannada), Santosh Subramaniam (Tamil), and Jaane Tu... Ya Jaane Na (Hindi) in a span of one calendar year. She was a part of online market portal eBay's 2010 "Dream House" challenge, where she transformed an empty three-room apartment in Bandra into an attractive home with online shopping. She had been provided a budget of ₹450,000 (US$6,300) and two weeks to create a look she wants with items on sale on the website. On the occasion of Children's Day (14 November), D'Souza auctioned a few items from the apartment. All proceeds received from the auction was given to Aseema, a Non-governmental organization (NGO), which aims to provide education to underprivileged children. D'Souza has been often tagged in the media as the "bubbly girl", after portraying the role of a young energetic girl in several movies, especially Jaane Tu... Ya Jaane Na (2008). She appeared alongside Shahid Kapoor on the fourth episode of Tere Mere Beach Mein, a celebrity chat show, hosted by Farah Khan. The theme of the show was "Second Innings", since both D'Souza and Kapoor had the same history of failures initially and success later in their acting careers. In June 2010, D'Souza was crowned as the "Brand Ambassador of the Year" at the CNBC Awaaz consumer awards, for endorsing nine brands. She is now the brand ambassador of the soft drink Fanta (replacing Rani Mukherjee), the chocolate Perk (replacing Preity Zinta), Virgin Mobile India (along with Ranbir Kapoor), Fastrack watches and accessories, LG mobiles (along with John Abraham and Abhay Deol), Garnier Light fairness cream, Dabur Vatika hair oil, Margo soap, and Spinz deodorant. In June 2010, she was the subject of a controversy, when a Tamil daily reported that she had attended the controversial 2010 IIFA Awards in Colombo. Several Bollywood actors and the South Indian film industry had boycotted the event, over the alleged killing of Tamilian civilians at the height of the conflict between the Sri Lanka Army and the Liberation Tigers of Tamil Eelam (LTTE) in 2009. The rumours of her visit to Colombo started after her friend Ritesh Deshmukh was seen at the festival in Colombo. Immediately, various Tamil groups and Kollywood associations demanded her films to be banned. In 2011, a controversy broke out for her film Force, in a wedding sequence scene of herself and John Abraham. Sources claim that the wedding ceremony and rituals conducted were so authentic that they would have actually been husband and wife in real life. Instead of a junior artiste, a real priest was called for the scene. Again, following the reports of Ritesh Deshmukh and D'Souza's marriage plans, the priest landed up at producer Vipul Amrutlal Shah's office to register a complaint. He insisted that the couple couldn't get married, as D'Souza has been already married to John Abraham, as all marriage rituals were observed, from wearing a mangalsutra (a sacred thread is worn by Indian women as a symbol of their marriage), to exchanging garlands, and taking the seven steps around the holy fire. Shah dismissed the claims as a publicity stunt. D'Souza is deeply religious and says that, she regularly attends Sunday Mass at St. Anne's Parish (Bandra), and whenever the family is home, a part of their evening is reserved for saying the rosary together. In an interview with The Times of India, she comments, "I keep a Novena every Wednesday at St. Michael's Church in Mahim." In an interview with Daily News and Analysis, she said that "My communication with God is conversational, [...] I'm God's favourite child; I believe that God has always been kind to me." Tabloids repeatedly linked D'Souza romantically with Ritesh Deshmukh, ever since they starred together in their debut film Tujhe Meri Kasam in 2003. They were reportedly ready to get engaged, but Ritesh's father, the then-Maharashtra Chief Minister, Vilasrao Deshmukh did not agree. D'Souza later denied any rumors of a relationship with Deshmukh, and responds that she had just friendly relations with him. However, the couple eventually got married on 3 February 2012, according to Marathi marriage traditions in a Hindu wedding ceremony, they had a church wedding the next day. The couple's first child, a son named Riaan, was born on 25 November 2014. Their second son,Rahyl, was born on 1 June 2016. ^ a b "Happy Birthday Genelia!". Planet Bollywood. Archived from the original on 3 November 2012. Retrieved 14 August 2013. ^ "Happy Birthday Genelia D`Souza". Patrika Group (5 August 2014). Archived from the original on 8 August 2014. Retrieved 5 August 2014. ^ Mahmood, Abdulla (15 July 2008). "Big-time girl: Genelia D'Souza". Gulf News. Archived from the original on 16 December 2010. Retrieved 23 August 2008. ^ Shankar, Settu (2007-04-19). "Genelia D'Souza". Daijiworld Media. Retrieved 1 March 2009. ^ a b c "Genelia's the brand ambassador of the year". The Times of India. Indo-Asian News Service. 30 June 2010. Archived from the original on 11 July 2010. Retrieved 20 September 2010. ^ a b Pilai, Sreedhar (31 October 2008). "Bollywood via Kollywood". The Times of India. Retrieved 1 January 2010. ^ "Genelia awarded for promoting East Indian culture through wedding rituals - Times of India". The Times of India. Retrieved 2017-11-19. ^ a b Brahma, Mahul (26 December 2008). "An Ingenue Is Born". Businessworld. Archived from the original on 18 December 2009. Retrieved 1 March 2009. ^ a b c Tahseen, Ismat (11 April 2009). "I'm God's favourite child: Genelia D'Souza". Daily News and Analysis (DNA). Archived from the original on 4 January 2010. Retrieved 1 January 2010. ^ Tiwari, Nimisha (25 December 2009). "Santa, bless Mumbai: Genelia". The Times of India. Retrieved 1 March 2009. ^ Das, Chuman (5 August 2009). "Genelia D'Souza brings in birthday at her new house". Business of Cinema. Archived from the original on 26 July 2011. Retrieved 20 December 2010. ^ Ramsubramaniam, Nikhil (2 July 2008). ""All my girlfriends have already gone crazy after Imran" – Genelia Dsouza". Bollywood Hungama. Archived from the original on 22 February 2009. Retrieved 1 March 2009. ^ a b "Meet Bollywood's New Bee Genelia D'souza". Daijiworld Media. 8 July 2008. Retrieved 23 August 2008. ^ a b c d Udasi, Harshikaa (17 July 2009). "Oye bubbly!". The Hindu. Archived from the original on 12 May 2011. Retrieved 1 January 2010. ^ Dasgupta, Piyali (12 July 2008). "Genelia is crazy about Beckham". The Times of India. Retrieved 1 March 2009. ^ a b Rasquinha, Reagan Gavin (13 September 2009). "She's no Sandra from Bandra!". The Times of India. Retrieved 1 January 2010. ^ a b c "I was not in awe of Mr Bachchan (Slide 5)". Rediff. 14 April 2005. Archived from the original on 24 September 2008. Retrieved 1 January 2010. ^ a b Jha, Subhash K. (29 September 2008). "I'm single, Riteish is just a friend: Genelia". Hindustan Times. Indo-Asian News Service. Archived from the original on 14 August 2010. Retrieved 18 February 2010. ^ "I was not in awe of Mr Bachchan (Slide 4)". Rediff. 14 April 2005. Archived from the original on 24 September 2008. Retrieved 1 January 2010. ^ a b c "I was not in awe of Mr Bachchan (Slide 1)". Rediff. 14 April 2005. Archived from the original on 23 September 2008. Retrieved 1 January 2010. ^ Rinki, Gupta (9 October 2010). "Genelia, the 'Uthamaputhiran' girl". Express News Service. The New Indian Express. Archived from the original on 28 November 2010. Retrieved 28 November 2010. ^ Mazumder, Ranjib (25 September 2009). "Genelia makes small screen debut". Daily News and Analysis (DNA). Archived from the original on 29 September 2009. Retrieved 1 January 2010. ^ Adarsh, Taran (3 January 2003). "Tujhe Meri Kasam (Movie review)". Bollywood Hungama. Archived from the original on 24 September 2010. Retrieved 20 December 2010. ^ "Tujhe Meri Kasam". Box Office India. Archived from the original on 14 July 2015. Retrieved 14 July 2015. ^ Jassi, Pallavi (5 February 2009). "Rising Star". Expressindia. The Indian Express Group. Archived from the original on 5 October 2012. Retrieved 1 January 2010. ^ "Ready to rock". The Telegraph. 11 January 2009. Archived from the original on 15 February 2009. Retrieved 1 January 2010. ^ "'Shankar has taken Tamil films to new depths'". Rediff Movies. Rediff. 9 September 2003. Archived from the original on 7 June 2011. Retrieved 1 January 2010. ^ "Sumanth stands out". The Hindu. 23 December 2003. Archived from the original on 12 May 2011. Retrieved 3 January 2010. ^ "Satyam". Sify Movies. Sify. Archived from the original on 28 October 2013. Retrieved 20 December 2010. ^ Devi K., Sangeetha (30 January 2004). "Genelia hits the jackpot". Hyderabad Times. The Times of India. Archived from the original on 12 May 2011. Retrieved 3 January 2010. ^ Gajjar, Manish. "Masti review". BBC. Archived from the original on 16 August 2005. Retrieved 1 January 2010. ^ Adarsh, Taran (9 April 2004). "Masti: Movie Review". Bollywood Hungama. Archived from the original on 12 July 2009. Retrieved 1 January 2010. ^ "Masti". Box Office India. Archived from the original on 15 July 2015. Retrieved 14 July 2015. ^ Kumar, G. Manjula (4 November 2004). "Lucky mascot". The Hindu. Archived from the original on 12 May 2011. Retrieved 3 January 2010. ^ Pillai, Sreedhar (18 March 2006). "Love and action". The Hindu. Archived from the original on 12 May 2011. Retrieved 3 January 2010. ^ "Telugu Actress of the Decade (Genelia D'Souza)". MSN Entertainment. MSN. 12 October 2010. p. 33. Archived from the original on 26 July 2011. Retrieved 16 December 2010. ^ "I was not in awe of Mr Bachchan (Slide 3)". Rediff. 14 April 2005. Archived from the original on 23 September 2008. Retrieved 1 January 2010. ^ Rangarajan, Malathi (22 April 2005). "Return to romance". The Hindu. Archived from the original on 3 September 2010. Retrieved 3 January 2010. ^ Kamath, Sudish (20 April 2005). "Vijay scores as `Sachein'". The Hindu. Archived from the original on 12 May 2011. Retrieved 3 January 2010. ^ "Patriotic theme". The Hindu. 11 March 2005. Archived from the original on 12 May 2011. Retrieved 3 January 2010. ^ a b c d e f g h i "Telugu Actress of the Decade (Genelia D'Souza)". MSN Entertainment. MSN. 12 October 2010. p. 34. Archived from the original on 26 July 2011. Retrieved 16 December 2010. ^ "It's a `Happy' flick all the way". The Hindu. 28 January 2006. Archived from the original on 13 February 2009. Retrieved 3 January 2010. ^ "The man behind Telugu hit Bommarillu". Rediff Movies. Rediff. 6 September 2006. Archived from the original on 29 October 2013. Retrieved 5 January 2010. ^ "First Look: 100 days of Bommarillu". Rediff Movies. Rediff.com. 8 November 2006. Archived from the original on 27 February 2012. Retrieved 5 January 2010. ^ Narasimhan, M. L. (29 December 2006). "A few hits and many flops". The Hindu. Retrieved 17 October 2007. ^ "Nandi Awards 2006". Sify Movies. Sify. 13 February 2008. Archived from the original on 26 November 2010. Retrieved 21 December 2010. ^ Devi K., Sangeetha (19 August 2006). "`Bommarillu' was a surprise". The Hindu. Retrieved 17 October 2007. ^ "Movie Review: Bommarillu". Sify Movies. Sify. Archived from the original on 13 May 2014. Retrieved 21 December 2010. ^ a b "Chennai Kadhal is a letdown". Rediff Movies. Rediff. 11 December 2006. Archived from the original on 7 June 2011. Retrieved 5 January 2010. ^ "Meet the star of Dhee". Rediff Movies. Rediff. 25 June 2007. Archived from the original on 17 May 2013. Retrieved 5 January 2010. ^ "Dhee is a good entertainer". Rediff Movies. Rediff. 16 April 2007. Archived from the original on 22 January 2010. Retrieved 5 January 2010. ^ a b c d Rajamani, Radhika (3 December 2010). "'I will not give up South films'". Rediff Movies. Rediff. Archived from the original on 4 December 2010. Retrieved 5 December 2010. Some of her films like Bommarillu, Dhee, Ready, Santosh Subramanian and Mr Medhavi, Katha have all been well received. ^ "Mister Medhavi: Not too smart". Rediff Movies. Rediff. 28 January 2008. Archived from the original on 5 May 2008. Retrieved 5 January 2010. ^ "Sathya...: Only for Shivraj Kumar fans!". Rediff Movies. Rediff. 31 March 2008. Archived from the original on 16 October 2009. Retrieved 5 January 2010. ^ "Movie Review: Santhosh Subramaniam". Sify Movies. Sify. Archived from the original on 17 July 2009. Retrieved 5 January 2010. ^ "Santhosh Subramaniam is a masala entertainer". Rediff Movies. Rediff. 12 April 2008. Archived from the original on 9 June 2008. Retrieved 5 January 2010. ^ "Bollywood calling". The Hindu. 14 June 2008. Archived from the original on 12 May 2011. Retrieved 3 January 2010. ^ Mishra, Somen (30 June 2008). "Genelia on Harman and Imran's common link". CNN-IBN. Archived from the original on 12 May 2011. Retrieved 23 December 2010. ^ "Baap re baap!". Rediff Movies. Rediff. 16 June 2008. Archived from the original on 27 February 2012. Retrieved 5 January 2010. ^ "Movie Review: Mere Baap Pehle Aap". Sify Movies. Sify. Archived from the original on 21 July 2009. Retrieved 5 January 2010. ^ Rajamani, Radhika (19 June 2008). "Watch Ready for Ram and Genelia". Rediff Movies. Rediff. Archived from the original on 25 December 2009. Retrieved 5 January 2010. ^ "Box Office 2008". BoxOffice India. Archived from the original on 2 January 2010. Retrieved 5 January 2010. ^ Sen, Raja (7 July 2008). "What would you do if I sang out of tune?". Rediff Movies. Rediff. Archived from the original on 14 February 2010. Retrieved 5 January 2010. ^ "'I could see my Sasirekha in Genelia'". Rediff News. Rediff. 29 December 2008. Archived from the original on 10 February 2010. Retrieved 5 January 2010. ^ "Movie Review: Sasirekha Parinayam". Sify Movies. Sify. Archived from the original on 16 July 2011. Retrieved 5 January 2010. ^ Masand, Rajeev (15 August 2009). "Masand's movie review: Life Partner is sexist". CNN IBN. Archived from the original on 17 September 2009. Retrieved 3 January 2010. ^ a b "Genny is thrilled to be back". Deccan Chronicle. 26 November 2010. Archived from the original on 29 November 2010. Retrieved 27 November 2010. ^ "Shahid does Chance Pe Dance". The Times of India. Indo-Asian News Service. 27 August 2009. Archived from the original on 1 September 2009. Retrieved 1 January 2010. ^ Masand, Rajeev (15 January 2010). "Masand's movie review: Chance Pe Dance is annoying". CNN IBN. Archived from the original on 18 January 2010. Retrieved 16 January 2010. Malani, Gaurav (14 January 2010). "Chance Pe Dance: Movie Review". Indiatimes Movies. The Times Group. Archived from the original on 17 January 2010. Retrieved 16 January 2010. "Review: Orange leaves audiences groping in the dark". NDTV Movies. NDTV. 26 November 2010. Archived from the original on 28 November 2010. Retrieved 27 November 2010. "Orange review: No freshness here". Sify Movies. Sify. Archived from the original on 29 November 2010. Retrieved 27 November 2010. "Orange: An overdose of love". Rediff Movies. Rediff. 26 November 2010. Archived from the original on 29 November 2010. Retrieved 27 November 2010. "Uthama Puthiran: son shines". Indiaglitz. Indiaglitz. Archived from the original on 20 November 2010. Retrieved 27 November 2010. "Uthama Puthiran: is a Hit". Sify Movies. Sify. Archived from the original on 12 November 2010. Retrieved 27 November 2010. ^ Nair, Unni R. (8 April 2011). "HISTORY in the MAKING". The Indian Express. Retrieved 14 April 2011. ^ Nagarajan, Saraswathy (30 March 2011). "Princess of the marquee". The Hindu. Archived from the original on 3 April 2011. Retrieved 14 April 2011. ^ Muthanna, Anjali (27 April 2011). "Shahid is a friend: Genelia". The Times of India. Retrieved 27 September 2011. ^ Joshi, Sonali; Kar, Vivek (28 March 2011). "Genelia to trade her sweet look for bold warrior role". India Today. Archived from the original on 2 November 2011. Retrieved 27 September 2011. ^ Joshi, Sonali; Srivastava, Priyanka; Varma, Lipika (4 April 2011). "B-town praises for Genelia D'souza's south flick". India Today. Archived from the original on 2 November 2011. Retrieved 27 September 2011. ^ Garia, Nikita (1 October 2011). "Review Round-Up: 'Force' Gets Mixed Reviews". India Real Time (Blog). The Wall Street Journal. Archived from the original on 3 October 2011. Retrieved 4 October 2011. ^ Adarsh, Taran (29 September 2011). "Force : Movie Review by Taran Adarsh". Bollywood Hungama. Archived from the original on 3 October 2011. Retrieved 4 October 2011. ^ "Top 10 Tamil grossers of 2011". Sify. 29 December 2011. Archived from the original on 28 October 2014. ^ "Riteish, Genelia are back together!". Times of India. 6 August 2011. Retrieved 30 July 2011. ^ Kamath, Sudish (31 January 2006). "Netru, Indru, Nalai is back with a bang". The Hindu. Archived from the original on 12 May 2011. Retrieved 3 January 2010. ^ "Judges (MegaModel & Manhunt 09)". Gladrags. Archived from the original on 12 May 2011. Retrieved 3 January 2010. ^ Mahaldar, Manisha (29 April 2009). "Stars dazzle at Lakme Fashion Week's first day". CNN IBN. Archived from the original on 1 April 2009. Retrieved 3 January 2010. ^ "PFMI 2009: and the Miss India crown goes to..." Femina Miss India. The Times Group. Archived from the original on 16 February 2010. Retrieved 3 January 2010. ^ "Sridevi, Genelia to walk the ramp, Couture Week, Day 1". Indiatimes Movies. The Times Group. 12 October 2009. Archived from the original on 15 October 2009. Retrieved 1 January 2010. ^ "Stars shine at Couture Week". NDTV Movies. NDTV. Archived from the original on 2 September 2011. Retrieved 1 January 2010. ^ Sahgal, Natasha (28 September 2009). "Genelia to host a show based on slum kids". The Indian Express. Archived from the original on 25 December 2009. Retrieved 1 January 2010. ^ Rasquinha, Reagan Gavin (24 October 2009). "Genelia: Slumming it out!". The Times of India. Retrieved 1 January 2010. ^ Bansal, Shilpa (29 September 2009). "Genelia has the Big Switch!". The Times of India. Retrieved 1 January 2010. ^ a b "Genelia Unveils New Spinz Black Magic Perfume Deodorant". Daijiworld Media. 7 October 2009. Retrieved 23 August 2008. ^ Tarunya, Suresh (17 December 2009). "CIFW Day 1: Ishita strikes jugalbandi with Genelia". The Times of India. Retrieved 1 January 2010. ^ "Genial Genelia". The Hindu. 29 August 2009. Archived from the original on 12 May 2011. Retrieved 3 January 2010. ^ "Football helps Genelia stay fit". Press Trust of India. The Times of India. 22 August 2010. Retrieved 15 November 2010. ^ "The eBay DreamHouse". eBay India. Archived from the original on 23 August 2010. Retrieved 15 November 2010. ^ "Genelia to auction items for charity". Galatta. Yahoo! Movies. 11 November 2010. Archived from the original on 12 May 2011. Retrieved 27 November 2010. ^ "Genelia's the new bubbly girl". The Times of India. 25 March 2009. Retrieved 1 January 2010. ^ "Episode 4 – Guests: Shahid Kapoor and Genelia (Theme: Second Innings)". Tere Mere Beach Mein. STAR Plus. Archived from the original on 16 January 2010. Retrieved 1 January 2010. ^ Varma, Anuradha (17 August 2009). "Salman still takes pocket money: Farah". The Times of India. Retrieved 1 January 2010. ^ Udasi, Harshikaa (18 June 2009). "Brand new faces". The Hindu. Archived from the original on 12 May 2011. Retrieved 1 January 2010. ^ "India's Youth Brand 'Virgin Mobile' – Now in GSM" (PDF). Virgin Mobile. 21 January 2010. Archived (PDF) from the original on 12 May 2014. Retrieved 20 September 2010. As another initiative to inch closer to the youth and take the brand to the next level, Ranbir Kapoor and Genelia D'Souza have been appointed as the new brand ambassadors for Virgin Mobile in India. ^ "Fastrack Says Genelia". Fastrack. 4 May 2010. Archived from the original on 30 October 2010. Retrieved 20 September 2010. ^ "LG eyes 10% market share in mobile handset". Press Trust of India. Business Standard. 18 February 2010. Archived from the original on 3 June 2010. Retrieved 20 September 2010. The company has roped in Bollywood stars John Abraham, Genelia D Souza and Abhay Deol to be the face of LG Mobiles. ^ "Genelia to endorse fairness cream". Indiatimes Movies. The Times Group. 29 January 2010. Retrieved 20 September 2010. ^ a b Pillai, Sreedhar (6 June 2010). "Genelia to miss IIFA!". The Times of India. Retrieved 24 September 2010. ^ "Skip IIFA: South Indian film industry to Bollywood". Deccan Herald. 29 May 2010. Archived from the original on 12 June 2010. Retrieved 24 September 2010. ^ Shah, Kunal M (17 March 2011). "John-Genelia almost married". The Times of India. Retrieved 4 October 2011. ^ Joshi, Tushar (9 July 2011). "'Genelia D'Souza is married to John Abraham'". The Times of India. Retrieved 4 October 2011. ^ "Genelia, John not married: Vipul Shah". NDTV Movies. Indo-Asian News Service. 10 July 2011. Archived from the original on 14 July 2011. Retrieved 4 October 2011. ^ Jha, Subash K. (30 May 2009). "Still denying Ritesh, Genelia?". Mumbai Mirror. The Times Group. Retrieved 1 January 2010. ^ "Genelia D'Souza: Age 21". Rediff News. Rediff. 25 August 2008. Archived from the original on 7 June 2011. Retrieved 4 August 2008. 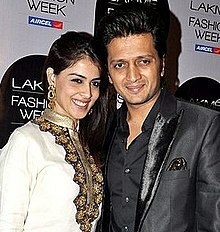 ^ "Riteish Deshmukh weds Genelia D'Souza". The Times of India. 3 February 2012. Retrieved 3 February 2012. ^ "PIX: Riteish and Genelia's church wedding". Rediff News. Rediff. 6 February 2012. Archived from the original on 4 March 2012. Retrieved 3 March 2012. ^ "Riteish Deshmukh-Genelia blessed with son". The Times Group. Archived from the original on 25 November 2014. Retrieved 26 November 2014. ^ "Genelia D'Souza announces their son's name: Riaan Riteish Deshmukh". CNN-IBN. 6 December 2014. Archived from the original on 7 December 2014. Retrieved 18 December 2014. ^ "It's a Boy! Riteish Deshmukh and Genelia D'Souza welcome their second child". Daily News and Analysis. 1 June 2016. Archived from the original on 2 June 2016. Retrieved 1 June 2016. ^ "Riteish Deshmukh and Genelia blessed with baby boy". Archived from the original on 4 August 2016. Retrieved 3 June 2016. ^ "Genelia was credited as Harini". Rediff.com. Archived from the original on 8 June 2015. Retrieved 17 September 2014. ^ "Telugu CineMaa Awards 2003". Idlebrain. 5 November 2004. Archived from the original on 25 May 2015. ^ a b "The award goes to". The Times of India. 9 July 2008. ^ a b "Adaminte Makan Abu gets Asia Vision's outstanding film award". The Times of India. 10 November 2011. Retrieved 11 November 2011. ^ "Big Star Awards 2012 / 2013 – Winners, Nominations". Indicine. 17 December 2012. Retrieved 2 February 2014. Wikimedia Commons has media related to Genelia D'Souza.